Artist Gail Foster has come a long way since her catastrophic fall and spinal cord injury in 2013. Since her most recent surgery this past March, she continues to gain strength and endurance every day, but it does not come without an enormous amount of assistance. Post-surgery recovery requires an endless list of appointments, medication, co-payments, physical therapy, and more. This is an ongoing journey that she is continuing to push through, and it’s crucial now more than ever as Gail approaches a huge opportunity in September. The Creative Access Award and Artist Residency funded by the Craig H. Neilsen Foundation will provide Gail with an extended artist residency at PLAYA in Summerlake, Oregon in September to October. Creative Access offers artists with spinal cord injuries the rare opportunity for concentrated time in a supportive and accessible residency community. Gail is one of 12 awardees for 2018, and this will be the first major travel since her surgery. 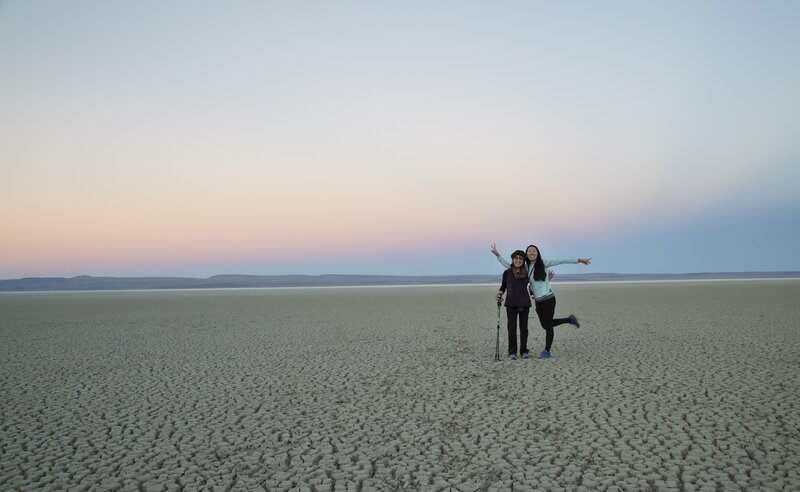 The PLAYA residency will provide Gail with the time and space to engage new terrain to inspire her creative practice for months to follow. However, the road to get to this date will not be easy. Every day, week, and month comes with more out-of-pocket medical expenses to maintain and further Gail’s progress. She sees a physical therapist twice a week and visits numerous doctors. Though Gail is using her wheelchair and walker effectively to move about and get around, she requires daily assistance, and every day is a fight to get stronger so that she will be prepared to make the most of her PLAYA residency. Our goal is to raise $19,000 to alleviate the costs of all the medical expenses that have come up during Gail’s recovery. She is at a crucial point in her health journey; PLAYA is a milestone and will rejuvenate her creative spirit in a way that cannot be found here in Atlanta. Every minute she is not working in her studio is more income opportunity being lost, but Gail’s focus is now on gaining as much strength as she can for this major upcoming trip. Thank you all so much for continuing to support Gail through the stages of surgery and recovery. Our lives have been forever changed by your donations and we cannot be more grateful for all the support that surrounds us. Thank you all so much for keeping Gail in your thoughts and prayers. ﻿We have great news to report: Gail’s thoracic decompression surgery on March 21st went well! She was discharged late Sunday from the Emory Ortho and Spine Hospital, where she took her first steps, literally, towards her recovery! A big step was also taken on the home front towards making our home long-term accessible. Acorn Stairlifts installed a chair lift, which now gives Gail access to our lower level master bedroom and back yard. Gail and her care team decided that her recuperation and therapy would progress better at home than in a transitional rehabilitation facility. Gail is thrilled to be back. For eight weeks, she mustn’t bend, lift, or twist her spine. A private pay nurse is with her 8 hours a day to help with her daily living activities. Her doctor ordered that an occupational therapist and physical therapist come to our home to work with her three times a week. 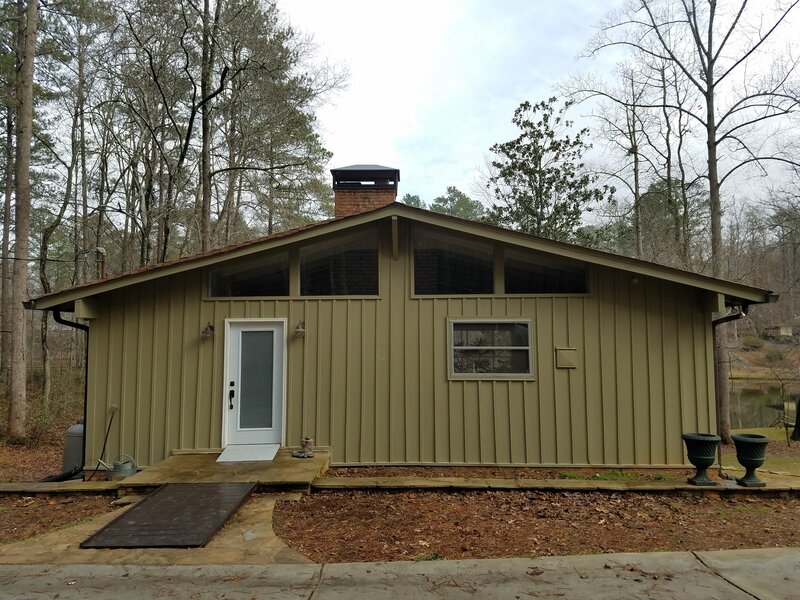 However, Gail’s insurance company does not have any therapists currently available to come to our home in Serenbe. The only options are outpatient therapy (which Gail is not yet ready for) or hiring someone privately. We are currently searching for therapists who will be able to care for Gail from our residence. The price of great healthcare is a hurdle we can’t jump over without help. To pay for her recovery home health care, our Help Hope Live goal is to reach $17,150 by April 9th. Also, Gail cannot fully use the bathroom, kitchen or other features of our home in their current, conventional design. The total costs of the home accessibility renovation are estimated at $85,000. Please know how much your donations to her campaign at Help Hope Live mean to us. Gail has been described in many ways: artist, philanthropist, and educator, and friend. However, in her most recent role as patient, she faces debilitating daily pain that has continued to increase with time and made it difficult for her to create. 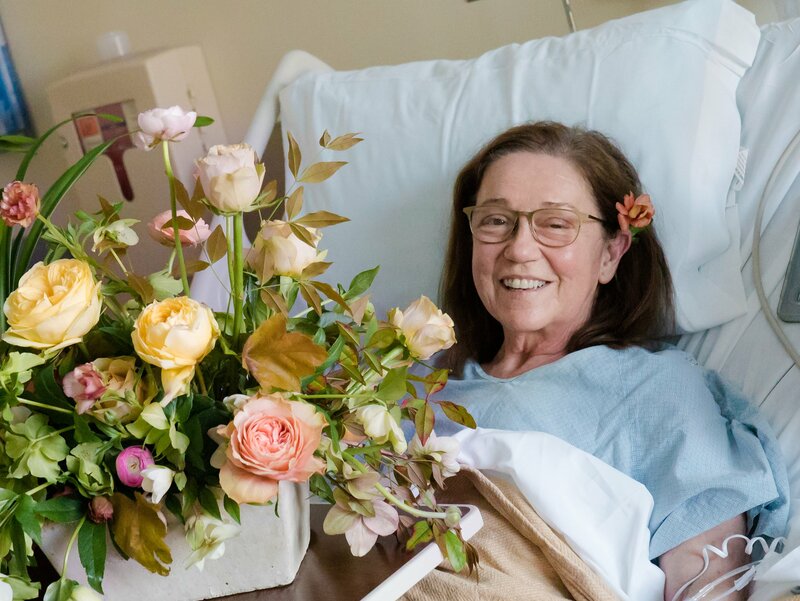 Dr. Heller, an internationally renowned lecturer and surgeon at Emory Clinic, has approved Gail for a necessary spinal surgery with a good outcome prognosis. Gail does not have much time to prepare. The surgery has been scheduled for Wednesday, March 21st! The initial out-of-pocket medical expenses for the surgery are $7,550. Post-op care for the 6 to 8 weeks rehab is estimated to be anywhere from $6,400 – $9,600. We have a minimum goal of $17,150! We are asking for help to meet this challenge within the next several weeks. This surgery came up quickly – before we were able to meet the goal needed to begin renovating the core house or making the Addition to our home. It is crucial for us to make our home safe and accessible for Gail. Some of the most pressing living needs include a ramp for the front door, stair chair lift installation, railing, bathroom remodeling, and accessible kitchen features. These projected expenses for the existing core of our home are estimated to be $30,950. You can view photos of our home, the needed stair lift, and more below in Gail’s photo albums. The Addition of an accessible bedroom, bathroom, and closet to the house is projected to cost $85,000 total, needing $17,000 to begin. During recovery, Gail plans to continue to create from her home while receiving medical care and art-making assistance. She will have six months after surgery to recuperate and strengthen as much as possible before going to PLAYA for her Creative Access Residency in Summerlake, Oregon! To help with the financial burden of uninsured expenses, a fundraising campaign in Gail’s honor has been established with Help Hope Live, a trusted nonprofit organization. All donations are tax-deductible to the full extent allowed by law. Please consider making a contribution today. To contribute, please press the GIVE button to the left under Gail’s name, call 1-800-642-8399, or see the box to the bottom left about mailing checks. Thank you so much for your kindness and generosity. DID YOU KNOW? If you are 70 ½ years old and older, you may be able to take advantage of an annual Required Minimum Distribution (RMD) by making direct transfers from your retirement account to any qualified nonprofit thereby reducing your taxable income. Does this apply to you? Please check with your tax advisor to see if you meet the criteria. Gail and Tom are currently traveling to the Umstead Gallery in North Carolina for their joint exhibition! The opening reception is tomorrow night, January 17th at 6pm. Gail’s work in that exhibition is primarily based on her Creative Access Residency experience this past fall at PLAYA, funded by the Craig H. Neilsen Foundation. Please check out Gail’s Photo Albums to see some of the works at the exhibition. Their work will be on display at the Umstead Gallery through March 2019. Gail had an inspirational time at her five-week Creative Access Award residency at PLAYA — however, during her stay, she struggled with several serious health issues. Since her return in late October, we’ve dealt with numerous doctor and ER visits and persistent symptoms that are making it very challenging for Gail to work, participate in physical therapy and daily life. Gail needs not just emotional and physical support but also help to pay for critical medical care before the end of this year. You can help by making a tax-deductible donation to the nonprofit Help Hope Live in honor of Gail. Please consider making a contribution today. My greatest joy at PLAYA was in seeing and staying in a part of nature that is untouched and being able to paint night and day. A sense of freedom led me as I experimented with wild new combinations of mixed media. My art dictates that I must share that joy; the experience flows through me as I paint and becomes someone else’s journey and joy as well. With all the wonder also comes great challenges. My health was difficult. It is common for people with spinal cord injuries to have low immune systems, and I had to receive my medications via mail. The timing of which was difficult at times, and I left PLAYA feeling very ill. I’m currently still trying to deal with my health issues and bring my system back up to par. Several pieces based on my experience at PLAYA are currently being installed at The Umstead Gallery in Raleigh, NC in an exhibition with Tom’s works. Tom and I will be returning to PLAYA to finish out my remaining residency award – three weeks this upcoming May! Thank you all for your support and care. Gail arrived at her Creative Access residency (residency award for writers and artists with spinal cord injuries) at PLAYA in Summer Lake, Oregon on September 23rd, and nothing could have prepared her for the outstanding beauty of this place. Due to the wildfires and smoke, her residency was pushed to begin on Sept 23 instead of Sept 3. 11 days have passed with many more to go but time and ideas are already taking flight! Check out Gail’s album of photos from PLAYA and stay tuned for more wonder! StudioSwan takes a Bubble Break! Tom and Gail took a 5-minute (maybe longer) bubble break to celebrate 35 years of Help Hope Live. #LifeIsFragile…but hope and community support can make all the difference. Help Hope Live has supported community-based fundraising to help families in medical crisis afford the care they need. They have been a crucial part in Gail’s journey to recovery and we cannot thank them enough for all the work that they do. We highly recommend you take your own bubble break and soak in all the beauty that surrounds you! Simply blow bubbles in a video or photo and post it to social with #BubbleBreak35 and @helphopeliveorg. When you’re done, you can also donate $35 to the nonprofit in the name of hope. More info at bubblebreak.net! 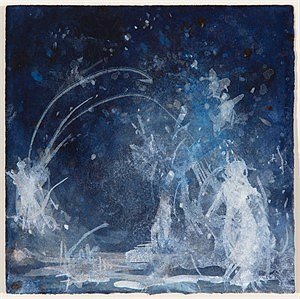 We are having a unique closing event to Art For Good: Foster & Swanston tomorrow! View NEW small works and receive the Friends & Family discount! The auction will officially close online on Sunday at 4pm – don’t miss your opportunity to make a tax-deductible art purchase or donation! Those who are not in the area are still able to bid on and purchase artwork online (artforgood.auction-bid.org) and the piece(s) will be shipped to you! Please contact us if you have any questions. The closing event will be happening in conjunction with Serenbe’s Play Me Again Piano “IDA” | Community Opening. The purpose of the exhibition & auction is to raise funds for Gail Foster’s ongoing non-covered medical expenses, post operative PT, and accessible home addition. 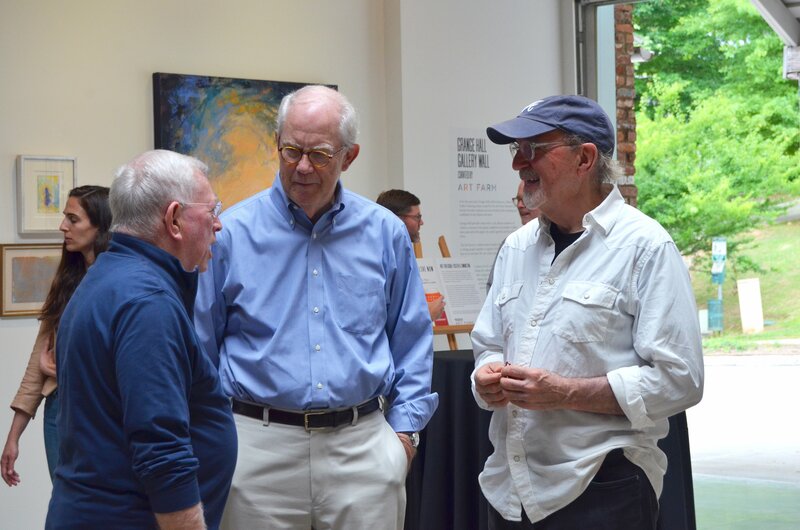 Have a look in Gail’s photo albums to view photos from the Opening Reception last month! We had a wonderful time in such good company. Gail and Tom are so excited to be partnering with Help Hope Live, the Art Farm at Serenbe, and GiveSmart for their upcoming art exhibition and auction fundraiser! Art pieces by Gail and Tom are discounted and already live on the auction website, available for purchase and bidding! The opening reception is at Grange Hall in Serenbe on Friday May 25th from 6 to 9pm. On Saturday May 26th at 5pm, Tom will have a book signing and artist talk. Those unable to make it to the events are still able to bid and purchase online! Proceeds from “Art For Good: Foster & Swanston” will be donated to Help Hope Live in honor of Gail Foster via the Southeast Catastrophic Injury Fund. Funds raised will be used to offset uncovered medical and expenses related to her home accessibility renovation. We are so happy to share that Gail’s surgery went well! She will be in the hospital for a few days and has begun some physical therapy already. We are currently working to figure out the best place for her to recuperate, weighing the options as our home doesn’t have fully accessible features yet. Thank you for your prayers and kindness, she feels so much love. Please continue to pray for her recovery and consider donating to the fund for her rehabilitation and home accessibility. Gail is having her spinal surgery tomorrow, Wed March 21st! Thank you deeply for your kindness, prayers, and generosity – we met our first goal to pay for the surgery! 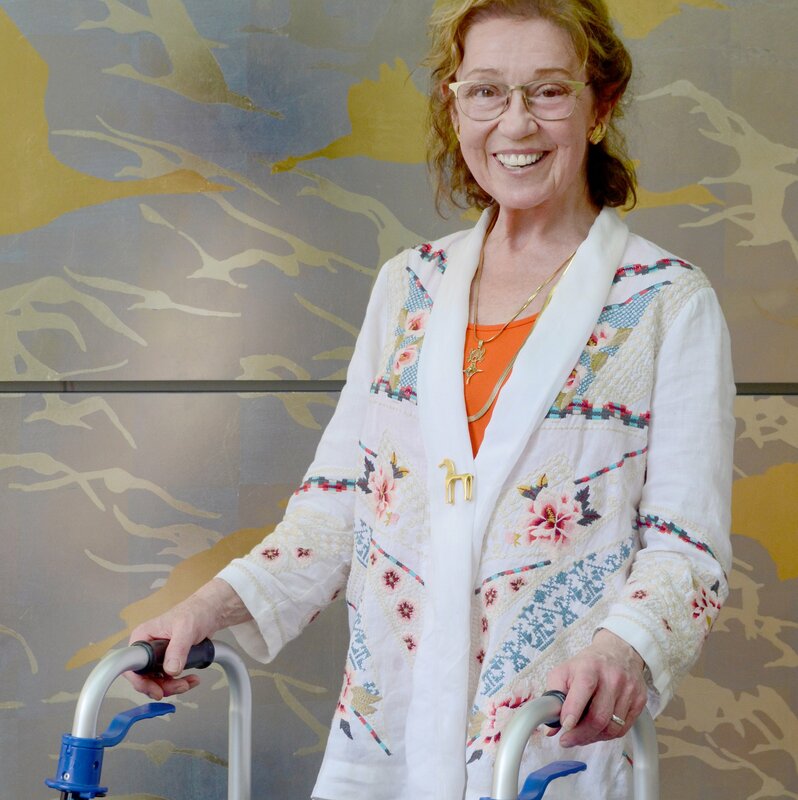 Gail’s post-op rehabilitation costs are estimated between $6,400 to 9,600. It is our next goal to reach $17,150 in the next couple of weeks! Please pray for the surgery to go perfectly well without any complications and for full recovery. Thank you again so very much. Stay tuned for updates on Gail’s progress. Congratulations to our very own Gail Foster on receiving a 2018 Creative Access Residency at PLAYA of Summerlake, Oregon! She will be spending eight weeks of dedicated time to her arts practice there this coming Fall. This fellowship is awarded to twelve individuals with spinal cord injuries nationwide thanks to the Craig H. Neilsen Foundation. Gail is thrilled and so deeply thankful. This video is about the residency’s wonderful program and beautiful setting. We want to thank each and every one of you for your generosity this year! Please consider donating to Gail for your tax-deductible donation in 2015! Through your kind contributions and prayers, Gail was able to bounce back from difficult complications of her injury. She was also able to create art in her studio again which is her driving life force. While moving forward on her healing path, she continues to be upbeat and positive. Her attitude is because of all of you. However, the financial burden is a difficult challenge. We are calling on your help. We are so close to our year-end goal! Please help us make this a reality. Remember its tax deductible and 97% goes directly to cover her uncovered medical expenses until midnight tonight. Dearest Gail , I am praying for your “Full Recovery “ !! Go Gail!! 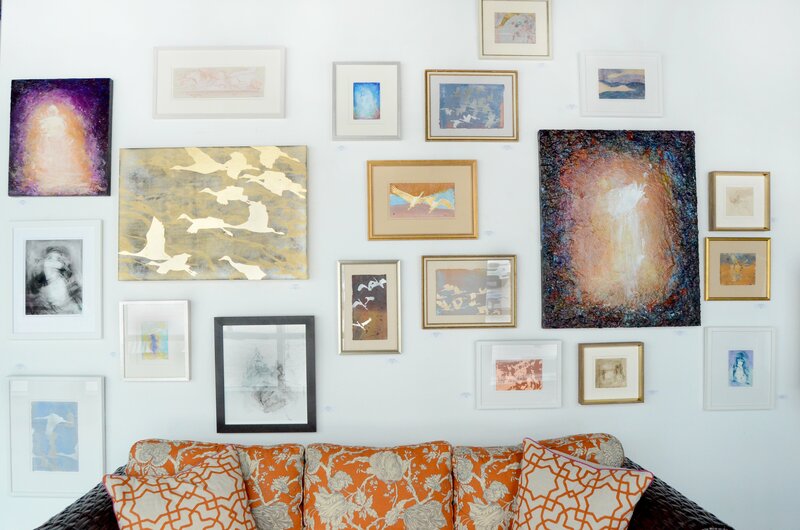 We can't wait to have your beautiful artwork at The Umstead's Gallery soon. Glad to see you on your feet and see the excitement in your face! Wishing you health and happiness - and safe and magical journeys ahead. One of Gail's paintings is on the cover of one of my CD's. A couple of her charcoals grace our living room and a print of one of her paintings glows in our bedroom. She is the most gifted of artists and our job is to provide a platform for her to spread the light of her artistic vision out into the world. Good luck,Gail! Lots of healing energy coming your way! We're very excited for your continued recovery and happy to help you get your home into a "home". Please keep bringing beauty into the world like you guys do. Thank you! We are thinking of you, thanks so much for letting us know Wishing you a speedy recovery. Love ya Gail and hoping for a speedy recovery!!! Can't wait to meet you one day Gail! You're an inspiration! Being fortunate to have several pieces of yours & Tom's work, here in my home, in essence, you are with me every day. I think about your strength, heart & brilliance & want the world for you. Love & admiration, full circle. We think the world of you, Gail ❤️ Your work is beautiful, as are you!! Wishing you continued recovery. heakikg prayers to you and all the best. You are an inspiration. Praying for you both...Are these paintings for sale? The beauty of your paintings inspire me and many others each time we gaze on them. Many blessings for health and peace. Martha E.